Microsilica is a highly reactive pozzolanic powder produced during the manufacture of ferrosilicon and silicon metal alloys. 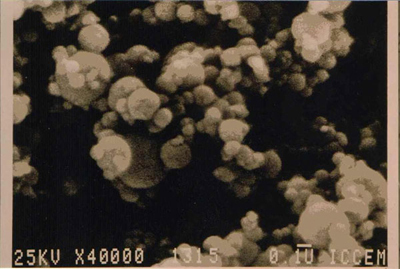 Microsilica powder is composed of ultra fine solid spherical particles of amorphous silica each approximately 100 times smaller than a cement grain. It is formed by the condensation of vapour during the smelting of coal, quartz, iron ore and other materials in an electric arc furnace at around 2000. 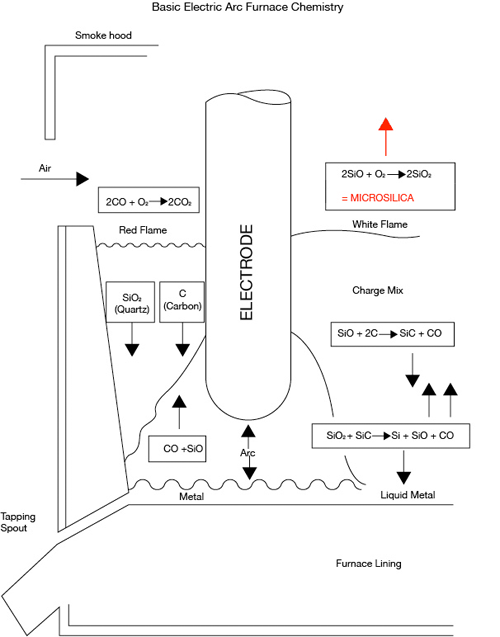 The vapour and furnace gasses travel through a heat exchange system at the end of which the by now solid particles of amorphous silica are separated from the gases via a bag filter system. Once captured it goes through an aeration process to increase its bulk density to facilitate handling and also to reduce the unit cost of transport. Microsilica performs two basic functions in hardening and hardened concrete. It is a reagent, reacting with calcium hydroxide to produce calcium silicate hydrates to supplement those already resulting from the mixing of cement and water, increasing concrete strength. It also acts as a pore filler to reduce the ingress of airborne and waterborne deleterious gases and chemicals, so protecting the steel reinforcement within. There are many other advantages. For further information see the microsilica performance section. There are many different ways in which our products can benefit from concrete performance. Click on the tabs below to find out how. MS 93 concrete shows increased strength throughout the curing cycle. This is especially useful in any application where concrete with a high early strength is required so that day to day activity is not interrupted for any great length of time. The hydration of OPC produces many compounds, including calcium silica hydrates and calcium hydroxide. The hydrates are the source of strength in concrete. When microsilica is added to fresh concrete it reacts with the calcium hydroxide to produce extra hydrates and so additional strength. MS 93 acts as a pore filler greatly reducing the ingress of harmful chemicals and the subsequent corrosion / carbonation of steel reinforcement. 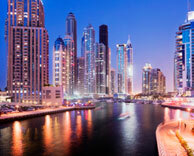 40% of the concrete placed during the development of Dubai contains 5% microsilica. It is also used extensively in the rest of the UAE Oman and Saudi Arabia. - below ground its function is to protect foundation and piling concrete from chloride attack by seawater and leached chlorides and other chemicals present in the porous limestone. - above ground it performs the same function against airborne chlorides resulting from evaporation from the sea in high climatic temperatures. MS 93 concrete will last longer than non microsilica concrete in areas of high abrasion. MS 93 concrete shows very high flow characteristics against non microsilica concrete for equivalent slump. MS 93 concrete gives a much improved resistance to freeze / thaw cycles. It should be used in conjunction with aerated concrete. MS 93 reduces hydroxyl ion concentration in pore solutions thus significantly reducing the risk of ASR. MS 93 significantly reduces washout during the pouring of underwater concrete. It will also greatly reduce rebound during the application of spray concrete so reducing waste, and also enable the application of deeper coats thus saving time in application. MS 93 reduces the electrical conductivity of concrete. MS 93 can replace OPC. - up to 35% of OPC in a mix at a ratio of up to 4.5 / 1 for equivalent strength. Microsilica 93 is widely used in this application for the following reasons. High strength and density combine to give a high resistance to impact. Bleed water will often raise fine particles to the surface of the fresh concrete. - this will later become a weak layer on the surface of the concrete. MS 93 will eliminate both bleeding and segregation in fresh concrete due to greatly improved particle packing. - the elimination of aggregate segregation prevents the gravity migration of aggregates in a static curing mix. 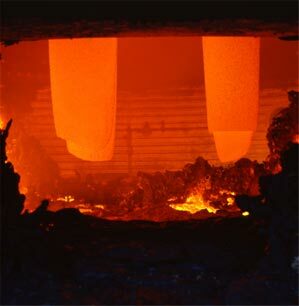 Microsilica is used in both monolithic and shaped refractories for several reasons. In monolithics it also offers advantages similar to those seen during the application of shotcrete/spray concrete in the construction industry. - Cohesiveness meaning a thicker coat can be applied with each pass thus speeding up application time. Microsilica is an amorphous form of silica. It is not crystalline. This important. Slurries are sometimes sold on the basis that there is some health and safety issue with powders. This is a nonsense. Carbon Enterprises has been marketing and supplying various grades of Microsilica into the European, Middle Eastern and West African markets since 1986. Over that time away from our day to day business we have been fortunate to supply our products into some signature projects. The Loft Gardens comprises 248 flats above an 150 room hotel, a spa and two restaurants, together with a roof garden overlooking Olympic Park. C75 concrete containing MS 93 is being used in the columns and transfer beams. 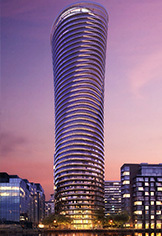 The 450ft, 45 storey Baltimore Tower is part of the Baltimore Wharf project adjacent to Canary Wharf. Whilst it is essentially a single use development the project also includes a restaurant covering the top three floors, and a large gym and cinema at the base. Test cubes to 106 MPA using MS 93. 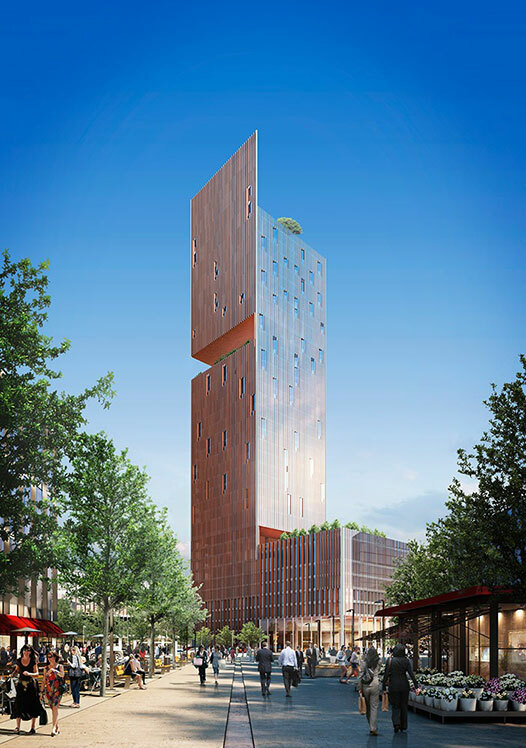 One The Elephant will be a 37 storey single use tower due for completion in 2016. The project also comprises a four storey pavilion and a leisure centre and will meet the criteria for Sustainable Homes Level 4. MS 93 was being used in the C 80 concrete for the structural columns. Contractor: Brookfield Multiplex/Construction Europe Ltd. 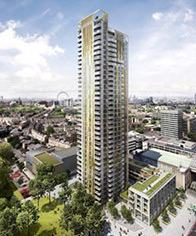 It is a 52 storey, 223 property residential development, 181 metre tall construction that is the tallest residential building in the UK. It Incorporates many energy saving features such as a wind turbine generator for communal lighting. Triple glazing glass and heat removal from aquifer water. Energy requirement will thus be reduced by 65% and CO2 emissions by half. 100 Mpa core concrete containing MS 93. At this time at 95 storeys The Shard is the tallest building in Europe. At 304 metres in height the interior comprises a variety of uses. From top to bottom, an observatory, residential flats, a spa, a 200 bed hotel, restaurants, offices and below that the lobby. 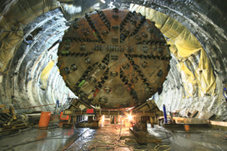 95 Mpa core and piling concrete containing MS 93 was used. The Crossrail Project is a 2 track, standard guage rail project from East to West London comprising a line length of 120 km and 38 stations. It will increase Londons commuter rail capacity by 10%. This is currently Europes biggest construction project. Great quantities of shotcrete are being used in the tunnel linings in the sections below ground. MS 93 is being used in wet shotcrete application. Stretching back for twenty two years Carbon Enterprises has supplied MS 93 into the Saudi Peninsula region starting with the Bahrain Aluminium Expansion Project that began on the eve of the first Gulf War and followed over the next couple of years by the 3rd LNG liquefaction Project for ADGAS on Das Island, at that time the largest one project supply of microsilica in the region. Delivery into Jeddah for several years has meant that the greater part of our supply is used along the Red Sea coast, the main areas of activity being at Yanbu, King Abdullah Economic City, Jeddah and Jazan Economic City close to the Yemeni border where accent is on petroleum and other heavy industries. Just up the coast from Jeddah at Thuwal is KAUST, The King Abdullah University of Science and Technology. This postgraduate university was opened in 2010. Shipping in via Jebel Ali Port in Dubai MS 93 has been used extensively in the development of both Dubai and Abu Dhabi. 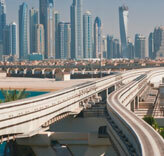 40% of the concrete poured in Dubai contained 5% microsilica against weight of cement. This resulted in vast quantities being consumed. Since the 2008 that quantity has dropped considerably. Prior to 2009 this Emirate advanced its development at a slower pace than Dubai next door. It also determined not to make the same mistake as Dubai that was attempting to grow its infrastructure at the same time as building up, resulting in immense congestion problems. 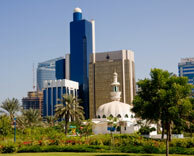 Abu Dhabi began with civil works. MS 93 has been used extensively in saline environment piling and foundation work that preceeded its use in high strength and low porosity concrete in the high rise sector. As in Abu Dhabi MS 93 has been used extensively in both civil and high rise applications, again for both high strength and for the protection of rebar from both underground waterborn and airborne chlorides and other deleterious chemicals. High strength concrete containing MS 93 was used above and below ground in the high rise residential development around the Marina. At 828 metres the tower is the tallest man made structure in the World. It is a mixed use development. Comprising roads, bridges and the Dubai Metro railway system they were largely constructed at the same time as the high rise and Palm projects giving rise to colossal all day traffic jams throughout the built up areas in the Emirate. Surprisingly, relief from the congestion came not from the completion of these transport projects, but from the vast exodus of people from Dubai starting in early 2009 which was directly connected to the financial crash. Microsilica was useful here in reducing the porosity of foundation and piling concrete and also for high strength in the Metro project. 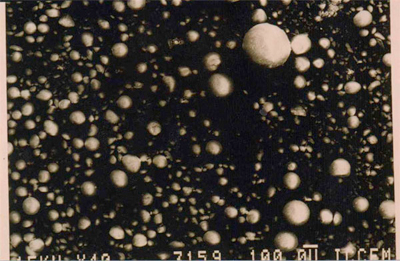 Electron micrograph of individual microsilica particles at x 40,000 magnification. Electron micrograph of densified microsilica agglomerates at x 40 magnification. Microsilica has an extraordinary versatility as a high-performance cementitious additive. It is used as a concrete improver or as an eliminator of potentially damaging reactions in certain mixes, and is used extensively in refractories. SiO2 (from quartz) + 2C (from coal/coke) = Si and 2CO. For this reaction much energy is required to produce heat. This is supplied by the arc of the electrodes submerged in the furnace. Iron is also added as a catalyst. The overall reaction can be divided into several steps. In the highest temperature zone, a cavity beneath the electrode tips, quartz reacts with silicon carbide forming gaseous silicon monoxide and CO and liquid metal which is continuously being tapped from the furnace. SiO2 + SiC = Si(liquid) + SiO(gas) + CO (gas). The gases formed in the cavity rise through the charge-mix and react on the way with raw material which is continuously fed to compensate for reacted material. Not all the silicon monoxide reacts with the carbon, some of it escaping the charge and rising to burn in air. Small dusty amorphous particles of about 0.1 micron in size are formed. These are then blown out of the plant with the waste gases. Attached to each furnace are two powerful electric fans which draw out the gases and smoke, and drive it through filter bags in the baghouse. The bags remove all the dust (microsilica) from the smoke. The next process involves the micro-pelletisation of the microsilica the forming of the dust into small spheres about 0.5-1mm in diameter. The reasons for this are threefold. Firstly, the bulk density of raw Microsilica, being almost as fine as cigarette smoke, is about 0.2 tonnes per cubic metre. The process of micropelletisation increases the bulk density to between 300 and 650 tonnes per cubic metre. This can reduce transport costs by as much as 65 per cent and so also the final cost to the customer. Secondly, due to its fineness microsilica is very difficult to handle. This process produces a material with the handling characteristics of fine sand without using a binder, and so avoids the problems that can be caused by foreign materials in the final mix. Thirdly, due to their shape and size the micropellets move very freely. This factor makes the silo storage, in-plant transfer (mechanical or air-blown) and eventual use simpler than with raw powder. The pellets do not stick to one another, and therefore any fouling and blockage problems are virtually eliminated. With a moderate amount of shear the pellets break up in water and disperse as effectively as raw powder or slurrified material. These gases were not filtered until the 1970`s, with the introduction of far stricter environmental legislation in many West European countries. Originally the filtering of this dust brought up the question of whether it could be used to some advantage. In 1975 the IPFEO, the association of ferro-alloy producers in Western Europe, offered 10,000 Swiss francs in reward for a feasible idea as to how the dust could be used. The prize was awarded to some Danish scientists who proposed the idea of using microsilica in waterglass. As it turned out the use of microsilica in cementitious environments became much more promising. Initially microsilica was used as an additive in Denmark, Norway, Canada and Iceland. Iceland had suffered for some years from an acute alkali-silica reaction (ASR) problem. The volcanic rock used as aggregate in the concrete is partly glassy and therefore reactive. The Icelandic cement is high in alkalis and in the Reykjavik area the aggregates are dredged from the sea. Furthermore, as a consequence of the geographical location in the middle of the north Atlantic, driving rains are common in Iceland. Therefore, the three parameters governing alkali-silica reaction in concrete: high alkalis, reactive aggregates and high humidity, are all present. There are different grades of alloy, the production of which give fumes of various grades. The SiO2 content, depending on the type of metal produced, can range between 50 per cent and 98 per cent.